Passionate leader seeking to answer God’s call to bring dignity, fullness of life to all and comfort to those in crisis or end of life. I seek to encourage loving and honest spiritual discussion on interfaith issues across divides. Masters of Divinity Austin Presbyterian Theological Seminary, Austin, TX. Graduated May 2016. Emphasis on Pastoral Care and Theology. Park Nicollet Methodist Hospital, St. Louis Park, MN; 2016-2017. 3 units completed serving ICU and Struthers Parkinson’s Center. Good Samaritan Hospital, Downers Grove, IL; 2011. 1 unit completed serving Level 1 Trauma Center ICU. Ordination Approved for ordination by Upper Midwest Region Christian Church Disciples of Christ; ecclesial endorsement for ministry of sacrament available. Serve as Elder First Christian Church, Minneapolis. Caring for individuals and their families nearing end-of-life, honoring dignity, fullness of life, mindful pastoral presence to seek ever closer connections between people and with God. Ministry with residents and staff in new facility with independent living, assisted living and memory care through worship, presence in one-on-one visits, and compassion. Ministry with patients, loved ones and staff of diverse cultures and values in multiple settings including end of life, ongoing chronic health issues, pregnancy infant loss, and other emergencies encountered in the hospital. Assess spiritual needs. Ministry with Parkinson’s clients dealing with dementia, declining physical capabilities and feelings of guilt for care givers. Provide sacraments and rituals to aid in the care and comfort of those sick, grieving, seeking meaning and purpose in health crises. Provide administrative leadership for Spiritual Care Director with data reporting regarding chaplain visits. Provided training for CPE interns. Proficient in Epic software for charting. Provided Vacation Bible School Leadership, designing curriculum and organizing volunteers. Assisted Faith Development Education programming. Preaching on occasion. Developed office administration efficiencies and data base management process improvements. Provided pulpit supply for multiple congregations; lead worship, develop liturgy and deliver sermons. Women’s Ministry Leader, Pflugerville Community Church; led team providing bible studies, annual retreats, community service, mentoring and fellowship. Lay Director for Brazos Valley Emmaus Community; led community through period of conflict. Ministries Leader at Immanuel Lutheran Church, Taylor, TX; chose curriculums for Sunday School, trained educators and taught young adult class. Finance Committee Chair, director of Live Nativity. 16 years at Dell, Inc., Round Rock, TX in various senior management roles including social media solutions for Fortune 500 companies, international management in customer satisfaction, operations process improvement, contracts and proposals. Forbes article: I was part of the “tiger team” mentioned regarding social media services. 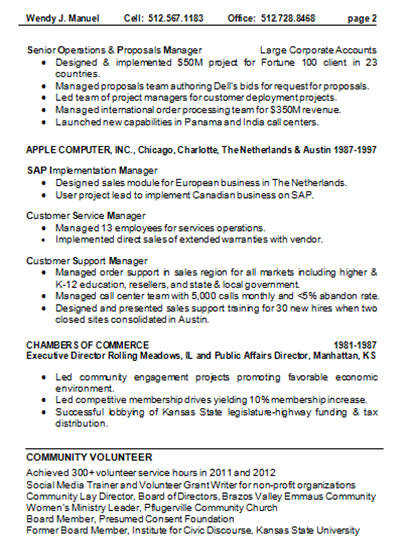 11 years at Apple in sales operations including systems implementation for Canada and The Netherlands.